Dental implants offer a permanent solution for your missing teeth.Other alternatives for dental implants include crowns, bridges or dentures – however, crowns and bridges can mean the destruction of the teeth adjacent to any gap as these are used to support the new tooth. Dentures are also not always favored as people dislike the idea of having to remove their teeth at night or to clean them! Dental implants really do provide one of the best ways to replace missing teeth. A dental implant is essentially a substitute for a natural root made from medical and dental grade titanium. The amazing thing with a titanium dental implant is that the body does not recognise it as a foreign object and so completely integrates. This means the dental implant works in harmony with your body and jaw to replace the root of any missing teeth. Each implant is placed into your mouth in the position of the missing tooth. 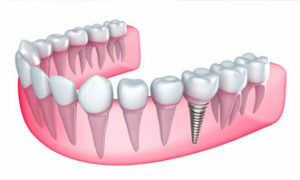 If we are only replacing one tooth then we will need one implant, if we are replacing two teeth then we will generally used to implants however if we are replacing between three and five teeth then often only to the dental implants will be used and we can suspend the the new teeth between these two implants. Often the implant can be placed at the same time as removal of the tooth all on the same day. This is what is known as immediate placement and is the ideal scenario. The reason this is such a good technique is that when a tooth is removed the bone around the socket has a tendency to collapse into the space where the root was. This naturally results in a loss of bone in the affected area and in the long-term can mean that placing dental implants is more difficult. If the dental implant is placed at the same time as the tooth is lost then the implant itself prevents additional bone loss thereby maintaining gum support and ensuring that the new tooth looks perfect.